A coffee plant in the state of Minas Gerais in Brazil has brown leaves from a recent drought. Coffee prices have doubled since late last year, and drinkers of the black stuff may soon start to notice. 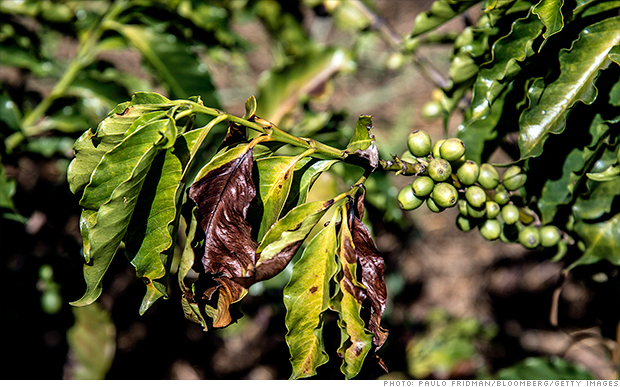 The culprit: a severe drought in Brazil, the origin of roughly a third of the world's coffee. The dry spell has wreaked havoc on this year's harvest of Arabica beans, which are used for the vast majority of global coffee production. "They had a big time drought in January and February, got some showers in March that stabilized the situation, but now they're entering their dry season," said Jack Scoville, a commodities futures broker with the Price Futures Group in Chicago. "It's harder and harder to get rain in there." While the spike in coffee futures, now at their highest level in more than two years, probably won't affect companies like Starbucks that lock in prices a few years in advance, it's bad news for Dave Anderson, owner of the Roastery of Cave Creek in Cave Creek, Arizona. Anderson typically buys coffee eight to 10 months in advance, so he hasn't yet had to raise prices on his customers, which include coffee shops and restaurants in the Phoenix area. But if prices don't reverse dramatically by the time he purchases another batch of joe in about a month, he'll be forced to pass on some of the cost to his clients. "I'll absorb some of it, but unfortunately the customer is going to have to share in the price hike as well," he said. But don't start preparing for the brutal effects of caffeine withdrawal just yet. "A coffee house might raise their price a by a nickle or dime," he said. "For most people at a restaurant, it's negligible." And with commodities prices in the midst of a multi-year slump, some hedge funds, traders, and brokers have profited from coffee's price surge. "It's been an animated market," Scoville said. "So I'm making a little more money."